Digestive performance, gut morphology and rate of digesta passage were measured in Brandt's voles (Microtus brandti) offered pelleted diets of low (25% neutral-detergent fibre) and high (38%) fibre content. Digestion coefficients of dry matter, crude fat, crude protein, energy and fibre were all significantly lower on the higher fibre diet. Although not significantly higher, dry matter intakes were more than maintained when extra cellulose was included in the diet, so that intakes of digestible energy were only 22% lower on the higher fibre diet. Total length and total gut tissue weight increased significantly, and the length and tissue weight of the caecum, proximal colon, and distal colon were significantly greater on the higher fibre diet as well. Total tract mean retention time (MRT) of a solute marker (Co-EDTA) was significantly greater than that of a particle marker (Cr-cell walls) on the lower fibre diet, and in the same direction on the higher fibre diet. The ratio of solute to particle MRTs (the solute/particle differential retention ratio) was 1.45 on the lower fibre diet and 1.19 on the higher fibre diet. There were no significant differences in marker MRTs between diets. 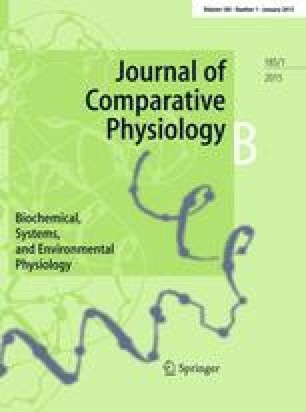 Examination of marker concentrations in the stomach, small intestine, caecum and colon of voles killed at 0.5-h intervals after a pulse dose of Co-EDTA indicated that the marker was recycled to the stomach by coprophagy. Thus, as in other microtine rodents, an increase in gut capacity, selective digesta retention and recycling of digesta via coprophagy enables Brandt's voles to utilise diets of higher fibre content than may be expected for such a small (45 g) mammalian herbivore.